College football is quickly approaching -- we’re 28 days away from the Gophers’ season opener on Aug. 30. So, with that in mind, I’ll take a look at Minnesota’s 12 opponents by asking five questions to a beat writer covering that team. Today’s installment is Game 9, Illinois. 1. After going 2-10 overall and 0-9 in the Big Ten last year, Illinois has nowhere to go but up. 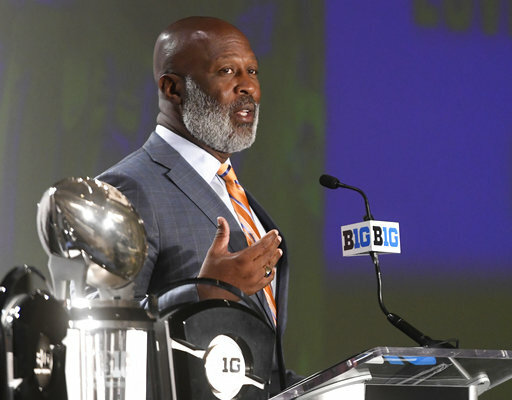 What must coach Lovie Smith and the Illini to do consider 2018 a success? It is pretty basic: improve. How you define that is the question. Some fans would say a bowl bid. But given the schedule and the youth of the team, I don’t think that is very realistic. Winning four or five games is possible. The first thing the team needs to do is play closer games. In 2017 that was rare. The pattern at Illinois for new coaches during my time covering the team has been to lose big the first season, lose close the second year and win close the third. Lovie Smith’s first two teams didn’t follow the second step, so it’s an unknown whether they can get to the third. 2. What can we expect from the Illini offense with sophomore QB Cam Thomas learning from new offensive coordinator Rod Smith? Right now, it is a mystery, which is how Lovie and Rod Smith wanted it. We saw very little of the live team work during the spring, and the one open practice didn’t show the entire offensive package. We know Rod Smith’s history and one thing he likes is quarterbacks who cause decision-making issues for the defense. He wants to spread the field and create mismatches. Cam Thomas played well in the spring and is a favorite to be the starter. But there will be four other scholarship quarterbacks on the roster, including three freshmen. If one of those guys plays well in training camp, there could be a season-long battle. Rod Smith wants balance on offense. With a solid group of running backs and an improved line with four sophomore starters, the running game might be surprisingly good. The receivers are an unknown, too, but Mikey Dudek appears ready to be full go after missing some time last season. I won’t be surprised if Dudek has a 60-catch, 1,000-yard season. He is a talent with great speed and great hands. 3. The Illini gave up 218.5 rushing yards per game last year, which ranked 117th nationally. Do you see improvement in that area this season? The defensive numbers will improve because the unit won’t be on the field as much. Illinois ranked near the bottom of the country in first downs, which meant very little rest for the defense. Illinois will control the ball better this season. The defensive line is the key. Bobby Roundtree and Isaiah Gay will be disruptive at end and Tymir Oliver and Jamal Milan are solid tackles. Linebacker has a very good foundation in Del’Shawn Phillips, but depth is an issue there. The young guys in the secondary played a lot as freshmen; they will be better. Safeties Bennett Williams and Stanley Green help against the run. … Rod Smith’s offense is as much trouble for Minnesota as it was when he was at Michigan and Arizona. Smith is a disciple of Rich Rodriguez, who produced high-scoring, potent offenses. Moving the ball has been a huge issue for Lovie Smith’s first two teams. He hopes the change at coordinator will go a long way toward fixing it. We will have the answer long before the Gophers get to town in early November. … The offensive woes continue in Champaign. Yes, there is excitement because of the new system, but also concern about the lack of playmakers at receiver and shortage of depth on the offensive line. And none of the quarterbacks have proven they have the ability to win a Big Ten game. Also, the Gophers are looking to improve this season just like Illinois. And Minnesota appears to be ahead of Illinois in the rebuilding process.